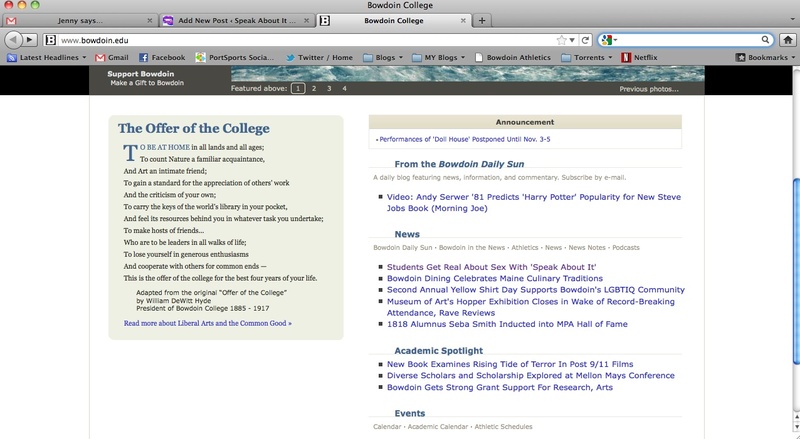 We are excited to say that we’ve been featured on the homepage for Bowdoin College, the place where Speak About It began and the current home of actors Laura Armstrong, Aviva Fiske and Chris Omachi (and alma mater of Shana Natelson, Nick Smith and Emma Verrill). A huge thank you to Selby Frame for a great article and helping spread our message for healthy sexual relationships. You can read the article by clicking here or by just visiting the Bowdoin website (we’re right on the home page, it’s pretty neat)! Stay tuned for more updates from the upcoming MECASA conference in Orono, ME. And, if you haven’t already, like us on Facebook!